Here are some of the best tips and tricks for puppy potty training. These lessons start the minute you bring home your new Schnoodle puppy. Whether you will be home all day to let out your Schnoodle frequently or you work a full time job leaving your Schnoodle to "hold it" for 8 or more hours, a Schnoodle puppy is easy to housebreak. There are going to be days when you can stay home with your puppy all day. This is when you need to pay attention to the signs and signals your puppy shows when he/she is about to "do its business". The most common signals are constant sniffing, crouching down and the most difficult to notice...finding a "hiding" place so he/she won't get in trouble. The first two you will notice right away. The last one your puppy will start to do once you have scolded it a few times for going in the house. Regardless, as soon as you notice one of these activities, immediately grab up your puppy and put him/her outside. On top of knowing your Schnoodle puppy's "signals", you will need to begin to establish a routine as part of your puppy potty training. Pick certain times throughout the day to always let your puppy outside. The BARE minimum should include 1) when you first wake up in the morning, 2) the minute you return home from work, and 3) before you go to bed. By always letting your puppy out at these times, he/she will begin to realize they don't have to go to bathroom in the house because their loving owner will let them out periodically throughout the day. Remember though, your puppy will need to be let out more frequently for a while until they start to control themselves...until they grow up. This is the same thing a child goes through when getting off of diapers. With that last thing said, expect accidents. Other good times to let him/her outside would be before you leave for work and after dinner. Puppy potty training is a process, not a one-time task. Be patient. The next thing you know, your floors will be as dry as before your puppy came home. On top of knowing your Schnoodle puppy's "signals", you will need to begin to establish a routine as part of your puppy potty training. If you are training your puppy to "hold it" all day while you are at work, you may want to close off an area or crate train your puppy. I did not crate train either of my puppies, but I heard it works. All I did was block off the kitchen for my puppy, Toby. The kitchen seems to be the best since it usually is the room that does not have carpeting. I made sure he had something soft to lie on. I also put down Puppy Pads in a few places around the kitchen. You could use newspaper, but the Puppy Pads are much more absorbent and cover up some of the smell. After a couple of weeks, Toby began to go to bathroom less and less during the day. You see, dogs don't like to make messes in the area they live in. Toby eventually learned to "hold it" until I got home from work. On the weekends, we started to let him have more and more free reign of the house by letting him roam around the whole first floor and then the entire house. We did this in steps to make sure he wouldn't start going in the house again. When your puppy does go on the carpet, the best product you could own to clean it up is Nature's Miracle. My sister (a Golden Lab owner) told me about this solution. It is the best carpet cleaner I have ever had. There has not been a stain I could not get up yet. The best part is it has some kind of chemical in it that kills the smell so the dog will never know it went to the bathroom there. Dogs will urinate in the same area over and over again if they smell it there and dogs have 10 times better smelling abilities than us humans. I have used this product on other stains too, and it has taken those up just as well. On top of knowing your Schnoodle puppy's "signals", you will need to begin to establish a routine as part of your puppy potty training. I almost forgot the best idea for how your puppy can let you know he/she needs to go outside. Hang a large bell or string of bells on the door handle at a height your puppy can use its paw to bang it without jumping on the door. When you let out your puppy outside during one of your routine times (you will be rushing too much when going outside after a "signal" has been detected), take his/her paw and hit the bell. Eventually, you can just tell your puppy to hit bell. Finally, your puppy will just learn to hit the bell on their own when they want to go outside. Your puppy may start to hit the bell for attention. Too avoid confusion, you will have to let out your puppy EVERY TIME he/she hits the bell. The bell is a great tool to help avoid unnecessary accidents if you don't notice your puppy is sitting by the door waiting to go outside. 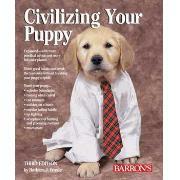 BARRONS CIVILIZE YOUR PUP(REV) Even the most docile among young dogs needs some training, and problem puppies need even more of it. The new, updated edition of this popular manual discusses the do's and don'ts of canine training, emphasizing methods that keep both dog and master happy members of a single household. Readers are coached on achieving humane but effective housebreaking, teaching a puppy to come when called, training the dog to walk on a leash, and to avoid fighting with other dogs. The author also instructs owners on teaching a puppy to accept bathing and grooming routines, behave when traveling in a car, and adhere to regular feeding habits. Prospective dog owners will also find valuable advice on prudent selection of a new puppy, with focus on acquiring a breed that best fits individual human personality types and family routines. The author's general approach to puppy training emphasizes teaching a dog good habits and breaking the bad ones without breaking the puppy's spirit.